Green Goddess Dressing from the Palace Hotel | What about this? Last weekend my son married the girl of his dreams. The venue was the beautiful Palace Hotel in San Francisco where my grandfather worked in the 1940s. While touring the historic hotel, a hotel staffer told me that the doorknobs on the tall mahogany room doors were the originals from 1909. As I walked down a long hallway, I touched several of the doorknobs, letting my fingers linger a moment on each of them. Goosebumps ran down my arms as I considered that my dear grandfather might have touched these same doorknobs. The Palace Hotel is famous for many things, one of which is its Green Goddess Dressing. According to the Palace website, “The Green Goddess Dressing was created at the Palace Hotel in 1923 by Executive Chef Phillip Roemer. 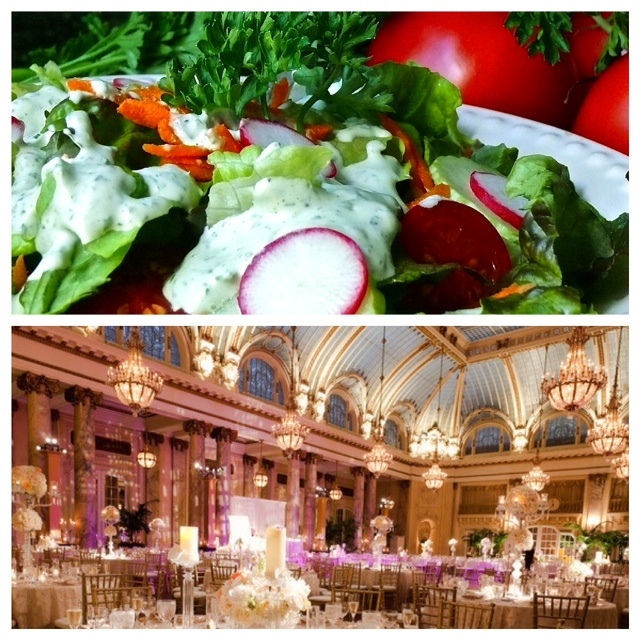 Chef Roemer created the dressing for a banquet held at the Palace. The event was honoring actor George Arliss who was the lead in William Archer’s hit play “The Green Goddess.” The creamy dressing is bright with fresh herbal flavors and goes well with mixed baby greens, fresh vegetables, or a seafood salad. Stir all the ingredients together in a small bowl until well-blended. Taste and adjust the seasonings. Use immediately or cover and refrigerate. The mixture will be white with green herb flecks in it. To make the dressing the classic green color, pour the mixture into a blender or food processor and give it a couple of whirls until it is the desired color.